Whatchoo Talkin' Bout, Willis? : First Post- Wheeee!!! ;Or, Why Jack in the Box Rules! First Post- Wheeee!!! ;Or, Why Jack in the Box Rules! So, OK, a little background for you. 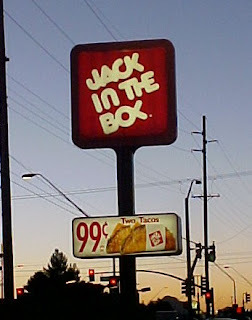 Until quite recently, the greater Denver area was without any Jack in the Box (which shall henceforth be referred to as JITB) locations for over two decades, due to a nasty little kerfuffle with the local Board of Health back in the late 80s. Suddenly, magically, new JITB locations are rising, Phoenix-like, from parking lots and shopping centers everywhere in the Metro area. As if that wasn't fortunate enough, I happen to live right by a recently-erected JITB, and can now go and satisfy my urge for delicious curly fries or any-time-of-day breakfasts as often as I please. My local JITB opened the same week I got married, and I honestly don't know which occasion my hubby and I were more excited about- I saw the "NOW OPEN" sign and the telltale stream of cars overflowing from the parking lot and I called him and was like, "DUDE, JACK IN THE BOX!!" and he met me over there without delay. We toasted each other with bacon cheeseburgers. Feel free to gag a little from all the cuteness...it's OK. Anyway, for anyone else who has lived in Denver for most of their lives, or anyone else who has never sampled the awesomeness that is a JITB double cheeseburger combo meal, let me lay a little knowledge on you. JITB was founded back in 1951 in San Diego. According to the official JITB website, there are only 18 states which currently have JITB locations. It makes me so sad to think that 32 states out there (and maybe Puerto Rico) have never experienced the tasty goodness. If you are a native of one of these JITB-deprived states, you're probably like, "So, OK, it's a hamburger place. What's the big deal?" No. No, no, no. You don't understand- it is NOT just a hamburger place. It is not just another McDonald's or Burger King or Wendy's (though I love those places too,BTW...) It is like the awesomest hamburger place ever, in my humble opinion. You know how you Chicagoans feel about your White Castle? Or maybe how you Los Angelinos feel about your In-And-Out Burger? Well, there you have it...JITB. JITB is not the only fast-food restaurant to have a clown as its mascot, of course, but it IS the only fast-food restaurant to actually acknowledge that clowns, and its clown mascot in particular, are creepy. While other fast-food joints continue to buy into the giant myth that everyone, especially small children, adore clowns and find them amusing and not at all nightmare-inducing, JITB goes ahead and allows its clown mascot, Jack Box, to let his freak flag fly. It's like they go out of their way to make him creepy. For starters, Jack is not a full-on clown; merely a giant Styrofoam clown head with a human body. And he dresses that body in power suits, not standard clown regalia, because you see, he is not just the mascot of JITB- he's the CEO. According to JITB commercial lore, Jack went all mavericky in 1995 and staged a coup to oust the existing board of directors, and now frequently runs rogue in commercials, doing all kinds of scary, Howard Stern-y type things such as running for President against Bill Clinton and creating his own boy band, the Meaty Cheesy Boys. As if a power-crazed clown head dressed like Larry King from the neck down isn't scary enough, they went ahead and let Jack get hit by a bus during the 2009 Super Bowl, only to wake from his coma several weeks later and remind everyone that you can now get breakfast at JITB any time of day. Jack's like the anti-mascot. Crazy, but awesome. 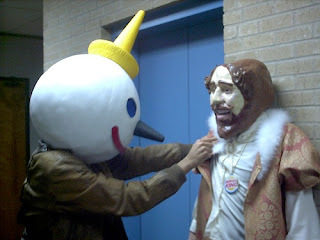 Jack vs. the equally-disturbing Burger King- Creepiest. Fight. Ever. Ooh, and did I mention the phat antenna toppers? They're little Jack Box clown heads that were introduced in 1995 (around the same time as Jack's ousting of the old Board of Directors) and immediately achieved cult status with all the high-school kids, hipsters, and anyone else who likes to stick things on their car in a humorous way. Anyway, all you have to do is stick one of these babies on the antenna of your car and you are saying to the world, "Hey, world- I'm a non-conformist for not eating at one of the Big Three hamburger joints, and I have an ironic, wry sense of humor. AND I don't care so much about my cholesterol levels, but that's OK because I know from a good burger!" Bonus points if you put the topper on a car in a state that is JITB-free. Jay Willy (my husband whose name is actually Justin Willis, but I call him Jay Willy) brought me back a JITB topper when he went a-visitin' in his hometown of Waco, Texas, and some butthead had stolen it off my antenna before the week was out. True story. So there you go- Jack in the Box! I have now made myself hungry for an Ultimate Cheeseburger and curly fries, so I must dash! Later.